We are so fortunate to work with local communities and communities around the world who are committed to the Earth and its sustainability. This page is dedicated to our partners that provide us with the fresh, homegrown ingredients that are the flavors of The Watershed Café. Peterson Limousin Beef is a family owned and operated farm in the St. Croix River Valley near Osceola, WI that practices pasture-raised cattle farming. This was our first farm interview, and we talked with Andy Peterson of Peterson Limousin Beef about the farm's sustainable practices. See the full news article here. To visit Peterson Limousin Beef's website, click here. Locally Laid Egg Company (LoLa) in Wrenshall, Minnesota is dedicated to the health and well-being of their chickens and the land. Their pasture-raised hens forage and roam outside getting exercise, fresh air, and a varied diet healthy for chickens. In addition to their focus on sustainable eggs, LoLa has a low-carbon footprint with an eco-conscience. The company won a LABO Environmentally Engaged Entrepreneur Award and engages in sustainable practices such as solar power, feeding with non-GMO corn, and planting a tree for every delivery & t-shirt sale (LoLa Facebook Page). Common Harvest Farm is a sustainable CSA farm set on 40 acres of diverse and fertile land in the St. Croix River Valley near Osceola, WI. This was our second on-location interview with our local farmers, and we walked through the details of CSA farming while Margaret Pennings and Dan Guenthner share their incredible journey of building a fruitful, small-scale produce farm. To visit Common Harvest Farm's website, click here. See our news article here. Foxtail Farm is a CSA located in Osceola, WI with a focus on providing fresh produce during cold weather months through their Winter CSA. In our third on-location interview, we talked with Chris and Paul Burkhouse about their "Morganic" farming philosophy and the details of growing produce in the winter in the Upper Midwest. See our news article here. To visit Foxtail Farm's website, click here. Click on the title or the photo to read an in-depth article about the sustainable practices of Steady Hand Farm. Steady Hand Farm, LLC located in Amery, WI is the vegetable CSA farm of Jason and Juli Montgomery-Riess. Using safe farming practices – without the use of synthetic pesticides or herbicides, nor use GMO seeds - Steady Hand Farm considers and promotes biological diversity. They work hard to produce food that is safe and keeps our human community vibrant, healthy, and preserves the good life of our companions in this work: the soil, plants, insects and animals with which we share land. For an in-depth interview with Steady Hand Farm, click here. To visit their website, click here. Crystal Ball Farms Organic Dairy is a family-owned and operated, organic dairy farm located along the St. Croix River in Osceola, WI. In our fourth on-location interview, we gained an inside look at life on the farm, as owner Troy DeRosier and manager Jessi Fouks walked us through the details of pasture-raised dairy cattle and processing organic dairy products on the sustainable farm. See the news article here. Cosmic Wheel Creamery lives at Turnip Rock Farm, a sustainable CSA in Clear Lake, WI. This small, family-owned creamery produces artisan cheeses including aged, raw milk, natural rind, and fresh cheeses. The farm is striving to create a whole farm ecosystem where each element of the farm is interdependent - a truly sustainable model that respects the surrounding environment and wilderness while building soil and providing healthy, beautiful, and delicious food. Established in 2010, The Beez Kneez is a honey production, delivery, beekeeper support, and advocay organization. Owned and operated by Kristy Allen, she keeps bees, delivers raw local honey by bicycle, educates beekeepers, and sells supplies. For more information about The Beez Kneez organic honey, click here. Skinny Jake's Fat Honey was founded in 2012. The organic honey is collected from hives on rooftops and in backyards from urban areas in NE Minneapolis. For more information, click here. The Maple trees in the St. Croix River Valley tell a sweet story made up of the neighborly efforts of one local resident and the community of many. Through the partnership and hard work of youth and families from area churches, and Don Hansen of Don's Sugar Shack in Taylors Falls, MN, more than 10,000 gallons of sap is collected from local trees to produce hundreds of gallons of syrup. 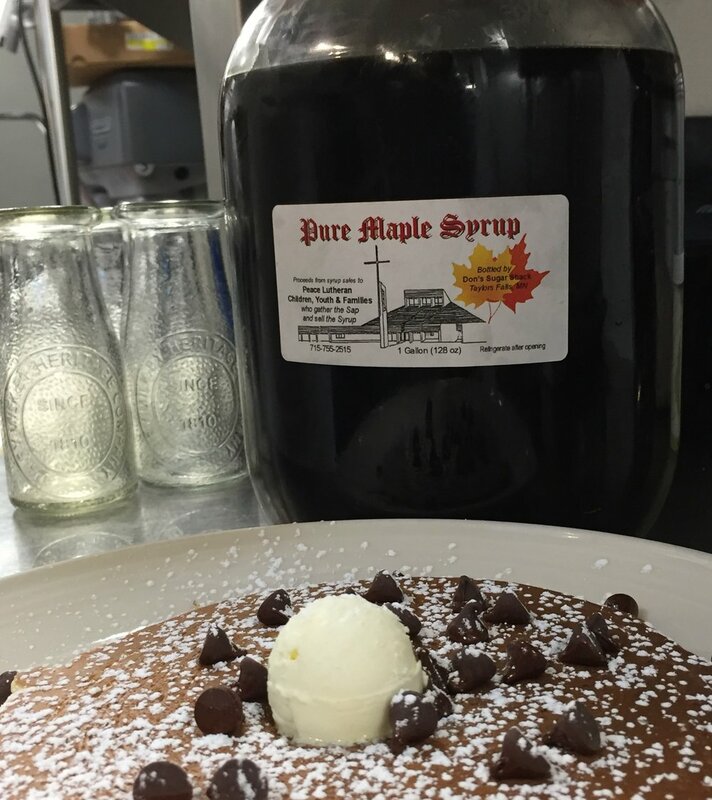 Proceeds of the syrup sales provide support for the youth of participating churches. Click on the title or the photo to read an in-depth article about the sustainable practices of Duluth Coffee Company. The Duluth Coffee Company is committed to providing quality coffee using high quality green beans, proper roasting and freshness. Green beans are selected based on understanding of the farm, processing and shipping, and the beans are roasted on-site in Duluth, MN. For an in-depth interview, click here. To visit their website, click here. Zenith Tea Works is a small-batch tea blending company located along the shores of Lake Superior in Duluth, MN. White Lion Tea is a woman-owned company with a focus on high quality teas and social justice. The company's Pride Mission supports young women in Kenya, providing scholarships and education to the girls in the villages where the tea and coffee is grown. For more information, click here. Upper Lakes Foods (ULF) is a small, family-owned and operated restaurant supplier focused on connecting restaurants with local, regional, and sustainable food producers. Through their Natural Marketplace, they offer sustainable supply distribution with natural, organic, and whole foods. To learn about our fun food show experience, click here. For more information about ULF, click here.